When I opened up my new Kindle 4 a few days back I got the feeling that the device is not meant to be taken apart or be serviceable. Taking it apart further would have been destructive. So I waited for another copy of Kindle 4 to show up at my doorstep before proceeding further. It turns out that I was right. Even the motherboard and battery are glued in. This means that there is nothing serviceable in the device. Display can’t be replaced, battery can’t be changed. Only repair possible is reflashing the OS. 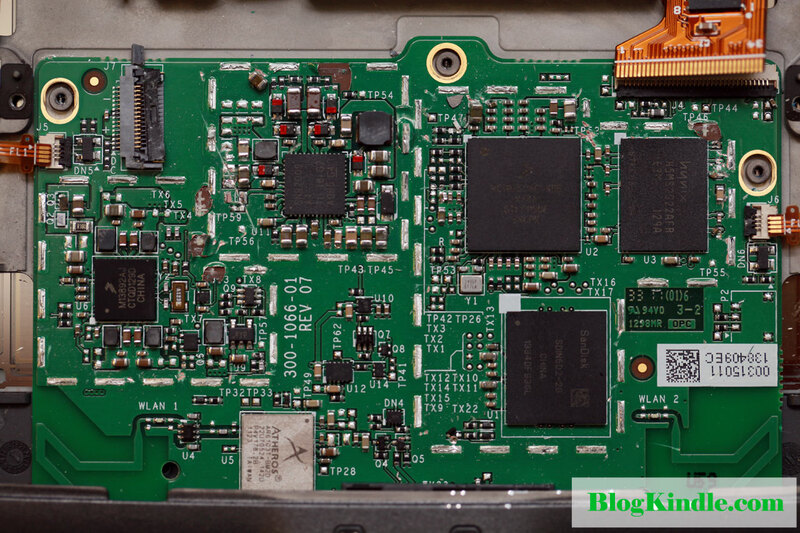 Battery management chip is Freescale MC13813892AJ CQQD129D. Memory is Hynix H5MS2G22AFR E3M 129A which is 256 megabyte module same as Kindle 3. It is apparent that Amazon put a lot of effort in minimizing the cost to make this Kindle model an affordable one. 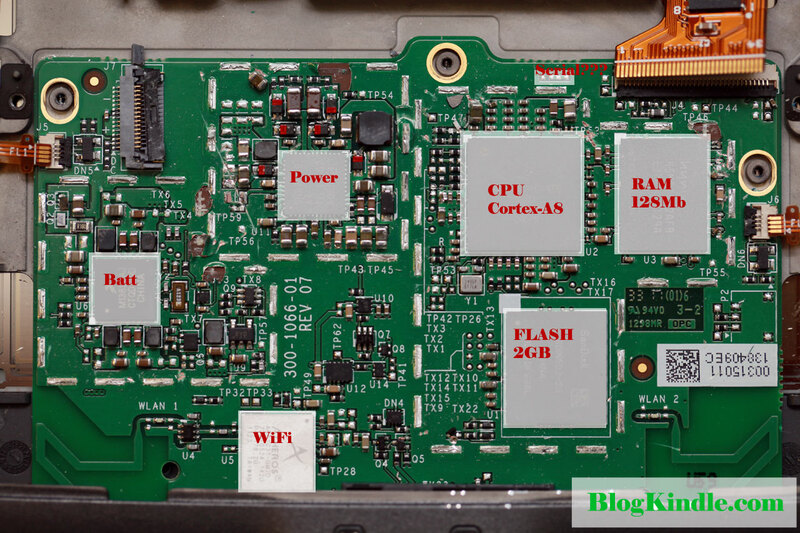 There is another chip which likely holds eInk controller firmware which is Winbond W25Q40BVIG 512 kilobyte flash chip. Battery is Lithium Polymer 890mAh. Don’t even think about replacing it. It is glued in tight and has only soft case around it so if you try to pry it off you risk ripping the cover and setting lithium on fire as it reacts with the oxygen in the air. It also has a custom connector to the motherboard. It is possible that there is a serial console right above the CPU. However the contacts are very tiny. It is nothing like easily accessible serial console on Kindle 3 located in the cover hinge or Kindle 2 that was accessible by removing top part of the cover. 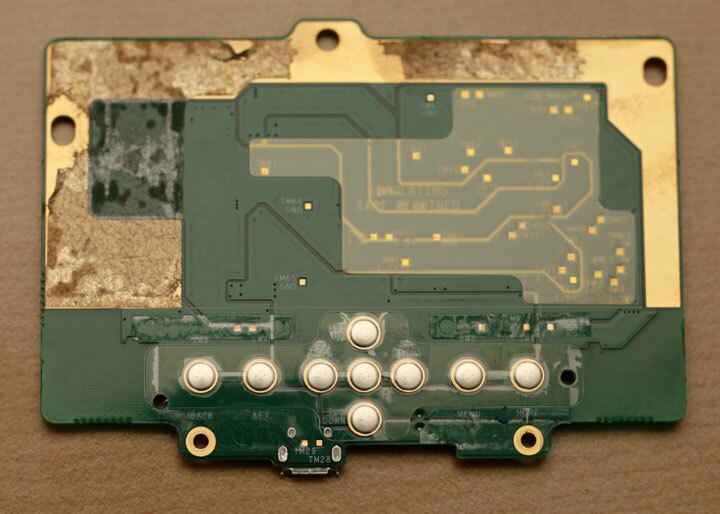 To get to this console you will need to do some precise soldering. Here’s a copy of the image above with components clearly marked. It is quite easy to peel off the front cover around the screen. It reveals button contacts along with a couple more screws that hold the motherboard. Here’s a picture of motherboard from the back. Just buttons and some test points that have been taped over. 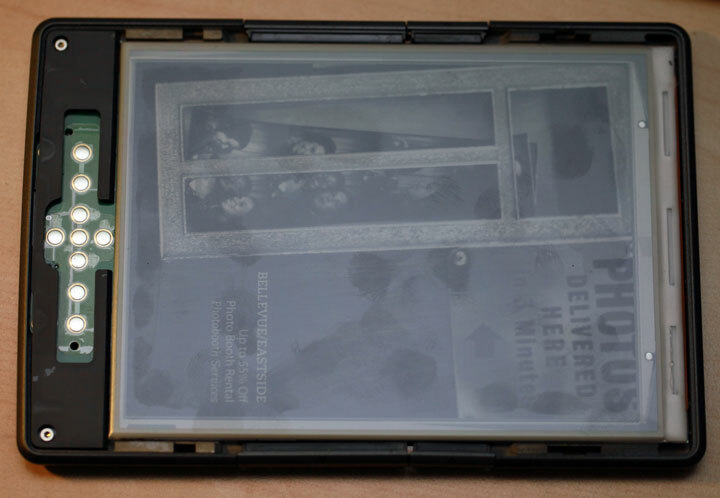 Pearl eInk screen is a thing of beauty and it still holds the image of Bellevue photobooth rental ad that was displayed as I powered the Kindle off to take it apart. It is glued solid to the aluminum frame of the Kindle. Trying to force it off caused back glass to crack. So while you can replace the motherboard, you can consider screen and battery to be part of the device frame. This entry was posted in Uncategorized and tagged AR6103T-BM2D, H5MS2G22AFR, MC13892AJ, MCIMX508CVK8B, SDIN502-2G by Dzmitry. Bookmark the permalink. It would be nice if you could donate the device with broken screen to the OpenInkpot project if you have no other uses for it. Sorry, but this device is already gone to another researcher. H5MS2G22AFR is 2G module.128M?? Where did you get the information? Thank you for pointing it out. It was late when I was finishing up this post and I made a few mistakes along the way. The thing I’d like to know but which NO review or teardown has yet said is the function of the 2 small metal looking tabs at the rear-bottom of the device. hello.. i’ve a question i wanna ask.. what should i do if the screen went half blank..? it looks like there is something wrong inside.. Your best option is to contact Amazon’s Customer Service. In the overwhelming majority of cases, they do a great job of getting these problems fixed. My kindle 4 Wifi is fully frozen, cannot restart with hard reset. But I need the serial number, but the box dropped to trash.